Got questions? Well, Quora has the answers. And it’s fantastic for entrepreneurs. However, most users aren’t taking advantage of Quora to growing their business. So here’s a comprehensive guide to doing just that. Let’s start with the basics. You can sign up via Twitter, Facebook, Google, or email address; for maximum credibility, we recommend using the social media platform on which you have the greatest following. Once you’ve logged in, we suggest immediately filling out your profile. Every time you interact with other users on the site—whether you’re answering a question, starting a discussion, or following another person—they’ll see your name, picture, and title. Use your full legal name for maximum credibility. In addition, we’d suggest using a headshot rather than, say, your business’s logo. Quora is a platform for people, not companies. Your title is probably the most important element. As an entrepreneur, you’ll want to make your title: “Founder/CEO of [company name]”; by doing this, you’ll be marketing your start-up with each post. Every user also has a description. These can range from a couple words to a couple paragraphs, but the most effective ones are short and snappy. I’m the founder of New Beats, a start-up changing the way musical talent finds agents. If you need inspiration, think back to your elevator pitch. Finally, fill out the rest of your profile: your areas of expertise (we suggest starting with the ones that relate to your business), your interests (again, bring it back to your business if possible), your educational history, where you’ve lived, and where you’ve worked. You’ll have different goals for Quora depending on where in the growth process your start-up is and what challenges you’re facing. You need funding, so you’re looking for angels and VCs. You’re looking for a co-founder or early-stage employees. You could really use more tech talent. You’d like to bring on some advisors or at least find a mentor. You need to put your start-up on important people’s radar. All five all of these may apply to you (and a couple more not listed), and that’s completely fine. However, it’s crucial to identify your needs so that you can craft the appropriate strategy. Once you’ve got your goals, you’ll have a much better idea of where on the site you should focus. Obviously, you’ll quickly be overwhelmed if you try posting in every topic that interests you or looks relevant. That’s where having goals is so helpful. For example, if you’re looking for tech talent, you’ll want to maintain a presence in “Software Engineering”. Whereas if you want feedback on your product, “Startup Feedback” would be a better fit. There are topics for everything, so keep searching until you find four to six that would attract the type of people you need to accomplish your goals. To keep track of the activity in these topics (including what people are asking, answering, and discussing), click “Follow Topic” underneath each one’s title. You’ve probably heard about user segmentation: the practice of dividing your users into groups based on key characteristics (age, gender, profession, etc.) so that you can deliver a tailored experience to each group. 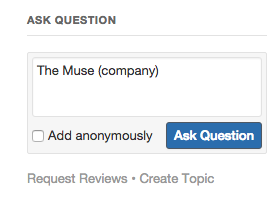 Well, Quora is actually set up for user segmentation. The platform gives you the option of changing which title appears next to your name for each topic you follow—which means you should customize it based on to whom you’re trying to appeal. Whereas if you’re in the “Technology Companies” thread to promote your business, “Founder of [name], a company that [insert purpose]” would be better-suited to your purposes. It doesn’t matter what you’re trying to get out of Quora, the most effective way to do so is to develop a reputation as a knowledgeable, polite, respectful user. Sub-communities on Quora are essentially self-run: users “upvote” (i.e. like) or “downvote” each other’s comments, which decides which answers and replies are shown first. You should aim to become one of the first three posters on any given thread. To do that, limit yourself to only contributing when you can add value. It’s better to reply to one post about a subject in which you’ve got expertise than three posts about things with which you’re only vaguely familiar. In the right-hand column of your profile, you can view who’s looked at your posts. This is akin to LinkedIn’s “See Who Viewed Your Profile,” and you should use it similarly. When people look at your answers, check out their profiles and decide if they’d be “good to know.” For potentially valuable connections, you can either message them and introduce yourself, or start contributing to the topics they follow. Both techniques will help you lay the groundwork for a strong professional relationship. After you’ve built the connection, you can ask them for advice, a referral, an introduction, and so on. 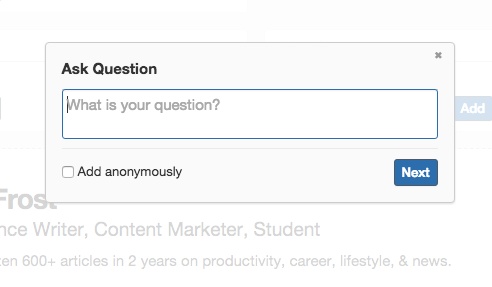 You can also receive lots of help and resources on Quora just by asking questions. To do this, click the blue “Ask Question” button on the upper right corner of the screen. One user recently asked for productivity tool recommendations in a startup-related topic. He received over 50 comments—not only did he get some awesome suggestions, but he also got lots of eyeballs on his profile. It doesn’t matter whether you’re posting an answer or a question: your main goal should be to add to the Quora ecosystem. So if you ask a question that someone else asked yesterday, your community reputation will suffer. However, if you ask a thoughtful, relevant question that’s applicable to other people as well, you’ll see good results. 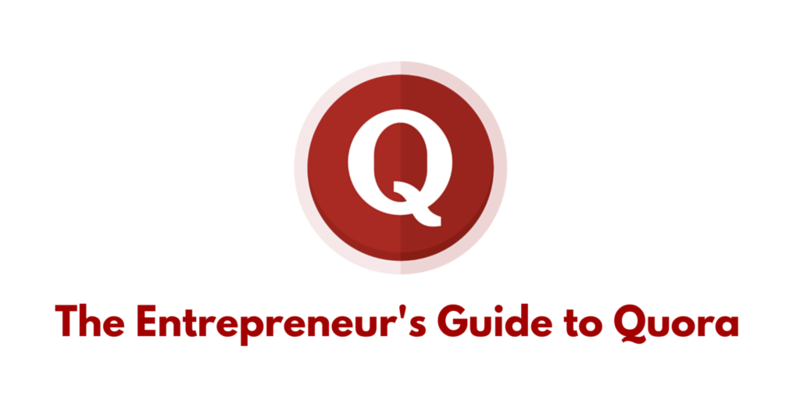 Many companies, from Squarespace to Stripe, have their own topics on Quora. But you don’t have to have Squarespace’s status to make your own. You’ll be given the option to describe your topic, so write a brief explanation of your company and what it does. Once it’s been created, you can share your company’s topic. We recommend sending the link to your network, posting it on your site and LinkedIn, and sharing it on social media. The more followers you have, the more activity your topic will generate, which will raise the profile of your actual business! In addition, once your startup grows, you can use this Quora topic to answer product questions, get feedback, develop a personal relationship with your customers, and more. Using Quora to grow your business is a non-traditional approach—and as an entrepreneur, that means it’s right up for your alley. Good luck, and may the upvotes be in your favor.